After George W. Bush was elected, something dramatically changed in the media. The news media had always been Left-wing, but with the explosion of social media in the early 2000’s, that Left-wing bias suddenly had a much bigger echo that never diminished. In fact, social media reverberated back into the news media, which reverberated back into social media, creating a never-ending echo trapped in a self-made chamber. This echo chamber generated so much power that it could fuel anything, like political comedy shows that savaged the political Right. Anything on The Daily Show that made Republicans look foolish was instantly trimmed into a bite-sized, shareable clip of Jon Stewart “destroying” the Conservative target of the week. The media didn’t stop there. It wasn’t enough that social media was another outlet to “boost the signal” of Leftist media; the Left needed groups to aggregate, focus, and curate Leftist media so that the messaging could be distilled into its most pure and motivating form. Sites like Upworthy polluted social media with videos and articles that drove traffic back to the Upworthy site where marketing automation could take over and begin the lead generation process. If you “liked” one of the more mainline pieces of content on their site, then they would ask if they could email you more content that you might like. It’s easy to see how a moderate person might be slowly shifted to the Left as the messaging ratched in that direction with each step in the campaign automation. The political Right had no similar apparatus. To this day it still doesn’t. What the Right should have learned from the Left is that ridicule and emotion are two very powerful tools, and the Left wields both masterfully. But even though the Left is really good at playing this game, the reality is that it takes two players, and, unfortunately, the Right has been playing by the Left’s rules for too long. The Left weaponized comedy to savage political opponents, and when the victims complained, they were accused of “not being able to take a joke”. And the Right played along, accepted the judgment, and backed down. And this is why I don’t think any of the other candidates would have stood a chance against Hillary. Not when the media controls the election. Only Donald Trump knows how to handle the media, whether it’s social media, entertainment media, or the news media. He proved yesterday that the news media will never cover the Right fairly unless they’re tricked into doing so. For instance, they’re not going to show off the sizes of Trump’s rallies — especially compared to Hillary Clinton’s. They’re not going to show the vile behavior of protesters at Trump rallies or ask those protesters if they’re Hillary supporters. And they’re not going to show Trump being endorsed by decorated Veterans…unless there’s a bigger “get” for doing so. Trump and his team understands this, which is why his “birther” press conference was such a masterful stroke! The video above is just the press conference, but Trump actually tricked the media into covering a tour of his new hotel in addition to what we see above, which is Veterans who have received the highest honors extolling Donald Trump’s virtues, before Trump finally states that President Obama was born in the United States. BUT! Trump maximizes his effort by reminding the public that Hillary Clinton and her 2008 campaign were the originators of the “birther” controversy, which is not widely known. So Trump actually got a lot out of this little stunt: free promotion of his hotel, free good press, and once again putting the media and opposition on the defensive as they scramble to defend Hillary Clinton and try to pin “birtherism” on Trump. Obviously, Hillary Clinton was already defending herself against “birther” charges as early as 2008. Donald Trump was nowhere near this issue back then. And now journalists are coming out describing Sidney Blumenthal, a key member of Clinton’s campaign in 2008, was circulating the “birther” angle back then. Just when I thought Donald Trump was going to have to untangle a bad appearance at a church in Michigan, he gives the media a much shinier object to fetch. It was a masterful move, and I don’t think any of the other candidates would have had the balls to pull something like this. 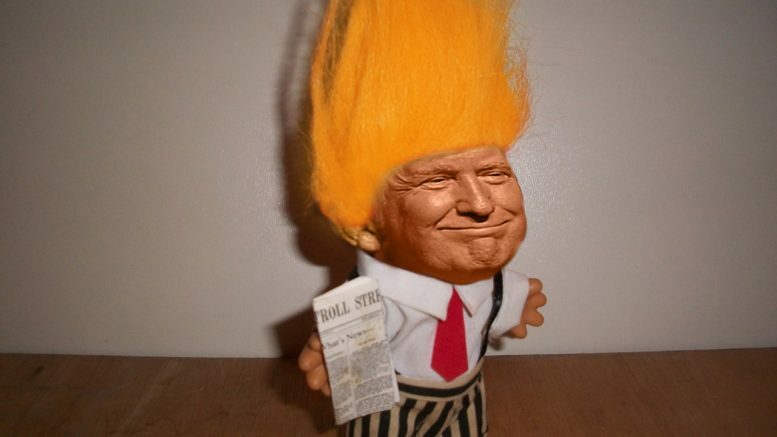 Be the first to comment on "Trump Trolls the Media"